We all love to indulge on Thanksgiving, but have you ever given any thought to how many calories you need to burn for that extra helping of turkey or that piece of pumpkin pie? 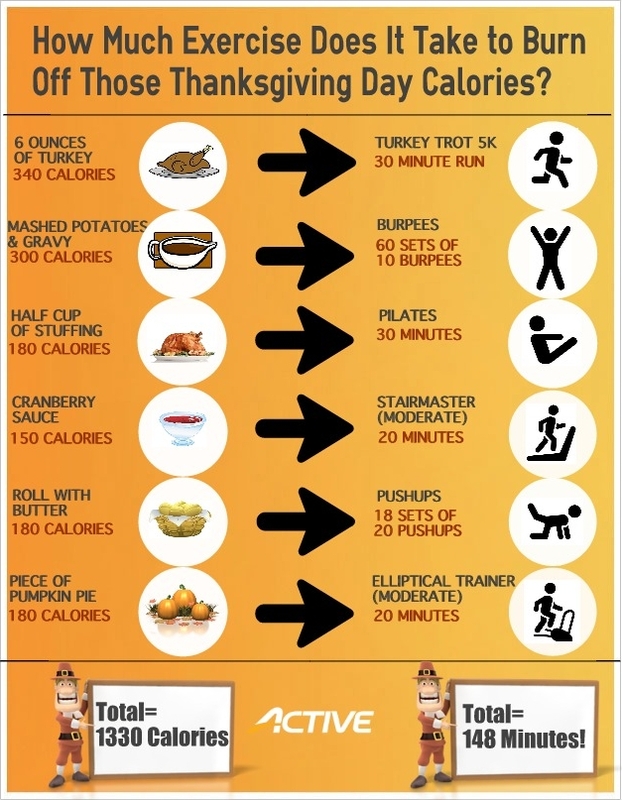 Check out the infographic below to learn just how many calories you’d need to burn in order to work off your Thanksgiving meal. 6 oz of turkey (about 340 calories), you would need to run for about 30 minutes which is the equivalent of those 5k Turkey Trots. Mashed potatoes and gravy (about 300 calories), get ready to get your blood flowing with 6 sets of 10 burpees. A half a cup of stuffing (about 180 calories), get out your mat for 30 minutes of pilates. 1 piece of pumpkin pie (about 180 calories), hop on the elliptical trainer for about 20 minutes at a moderate level.